Student-doctor Matt Partain (emphasis on the student much more than the doctor) is here with an update for all of you who avidly read Terry’s blog. Terry has given me the green light to talk about some of my experiences here in Tanzania and give him some time to work on responding to all the wonderful emails all of you are sending him. Currently, I have been spending some busy days in clinic. On Mondays, Tuesdays, and Fridays, I work in Moshi at a cardiology clinic and medical dispensary, seeing patients with a translator present, or helping with physical exams, EKGs, and echocardiograms. On Thursdays, I travel about 20 km up the side of Mount Kilimanjaro to volunteer at Kibosho Hospital, a fantastic rural hospital that many people from the Mailisita Foundation have visited. I have been working in the pediatrics ward and also in the minor surgery clinic assisting with suturing wounds and draining abscesses among other random doctor-ish things. While my clinical experiences have been fantastic and extremely beneficial to my education as a young physician, my favorite day of the work-week comes when I’m not at clinic. On Wednesdays, I spend the day at Stella Maris working with Mr. Terry, Agnes (a teacher’s aide), and the watoto of Stella Maris. With the help of an epidemiologist at Loyola and my medical school’s Global Health department, I’ve designed a nutritional survey and health-screening program for the students. The basis for the project comes from my past experiences at Stella Maris and in the Mailisita community. Aside from when they are very sick, children here do not go to dispensaries or to see a physician. It is simply too expensive for our children to seek out consistent health care. Also, the lives of our children outside of their school day can be pretty hectic. The past two years have seen droughts grip the Kilimanjaro area, and farming crops have not been as plentiful as in years past. This puts the poorer families in the area, many of which have children that go to Stella Maris, in a difficult situation of not being able to provide enough food for their families. Our exam for the children is fairly simple. It involves taking height and weight, blood pressure, pulse, temperature, and looking for vitamin and iron deficiencies, as well as ring worm and scabies. We also take time to interview each student and ask about their home lives and how much they are eating when they’re not at school. We want to be sure if kids are only having tea for breakfast or have to skip meals due to inadequate food at home that we can ensure they are eating enough when they are at school. For lunch, Stella Maris serves a delicious Tanzanian meal called makande, which is a medley of corn meal and beans and the kids get plenty of it. During our screening, we identified some students that have families that cannot afford to feed them on the weekend. Mr. Terry and I are working on a plan to provide them meals on the weekend from the guesthouse and also work in some tutoring too! I haven’t crunched the numbers on the data we have already collected, as I have three more weeks here to survey and screen the children. However, I have hope that this project will allow us to identify students that need more food in their diet and also tailor our meals here at Stella Maris to optimally provide for our students. It will be especially important to do so in the coming years as our older students start to enter puberty. One theme that keeps permeating my time here in Tanzania is that of vulnerability. I see it constantly in the clinic and in the hospital. People come in wounded, hurting, and sick and they turn to the people in white coats looking for assistance and answers for their illness. I’ve found myself in difficult situations that have overwhelmed me. This past week, I held hands with a 14-year-old boy moments before cutting open and draining a swollen hematoma on his leg. During the procedure as he wailed in pain (since we didn’t have adequate pain medication for him), I could hear him screaming “asante” (thank you in Swahili), over and over between sobs. I walked out of the minor surgical theater both frustrated and shaken to my core. It is frustrating to put someone so young through that much trauma when elsewhere with different medications, he might not have suffered as much. Yet he showed so much courage and trust in me to be able to sit on the operating table and let me clean and care for his injury. In moments like that, I feel the responsibility of the coat I am privileged to wear and weight of all things. P3 students enjoying their makande! In the same vein (pun intended), the children of Stella Maris show similar vulnerability. They have shown such a willingness to speak English at school to each other and to the teachers, even though it is not their native language. When they speak incorrectly, they are so open to being corrected. Each child here wants affirmation that they are learning. I have seen such a growth in the P3 class since I last saw them in P1 two years ago. Their fluency and confidence in their English has grown tremendously and I can’t help but be proud of them, proud of their teachers, and proud of Stella Maris. It’s hard to pick a single moment from this week to start off with… but on Wednesday I found myself holding hands with Alphonce and Priscus in a circle with 40+ students, one of my best friends from America, four Tanzanian teachers while we sang, danced, and stomped all as a part of a lesson on Traditional Tanzanian Dance… all I could do was laugh and smile. Just three weeks ago I said goodbye to my students in America, and now here I was back in Africa with my other students and I could not be in a better place. I know my students in America are ok (because they still comment on my blog and email me!) 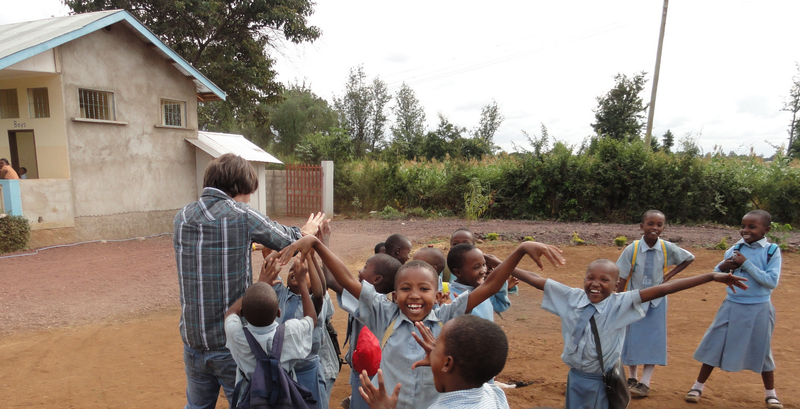 and I know now that I can be here for my students in Tanzania. Their smiles remind me daily of the enormous opportunity and responsibility I have to fulfill here. My first week back in the classroom was supposed to start slowly. We have some student teachers here with us for the next few weeks, but I can be persistent at times. I was told multiple times by my African mama and headmistress Mama Shayo “be cool Mr. Terry”, because she was afraid I might get tired. Eventually she gave me two English lessons on Tuesday which then snowballed into more lessons. On Thursday Mama walked into the room in the middle of my P3 Math lesson and I stopped mid-sentence like a deer in the headlights since I was supposed to be observing…she laughed and said “Ok Mr. Terry you’re back”. The Mama Shayo that I know is hilarious and we constantly laugh together, but the children do not always see this side of her. The teachers in Tanzania are often very stern and strict, so when Mama started laughing seeing me teaching the P3 children again, all the children started laughing too. I have had the amazing opportunity to teach these children in P1, P2 and now P3, which is their entire school lives and my teaching life as well. There is just such tremendous joy with having myself, Agness, Mama Shayo and the children all together laughing knowing now how far we have come together. I guess it took me a whole week, but I finally feel like I am doing everything I came to do. I am teaching, taking care of the children, taking care of the guests as best I can and searching out new ways I can support the community. On Wednesday Dr. Matt and I spent the whole day doing general health check-ups for all the children in P3 as a part of his research project for Loyola. I will let him elaborate further (this week I promise! ), but one of my greatest difficulties coming from America is to not compare my students. Very simply, at least half of my P3 students in Tanzania are smaller than my first grade students in America still. Part of it is cultural, but it also is in part due to environmental factors like poor diet. It is always difficult to look at the children I have grown to love so much and know that are now 9-10 years old and they still only weigh 45 pounds. We have improved the food at the school by offering them makande (a beans and corn dish which most schools don’t serve to children this young because it’s too expensive) but even still there is improvement to be had. I am currently trying to figure out the cost of improving the diet financially because there are immediate ways like adding more beans, milk, carrots or even peanuts that can enhance the makande. Many of the children depend on the school for this meal, which some days may be their only meal. We have such a great opportunity to make a difference in their health if we can further improve this one meal! The bible I have here is the one most readily found from the local markets from the American Bible Society from 1976 “The Good News” so forgive me if your proverb translation doesn’t match, but I was reading the Proverb 25:11 “Be generous and you will be prosperous, help others and you will be helped.” I feel this fits so perfectly for my first week in school. I have never felt richer and more prosperous than when I am here. My prosperity is not monetary but thankfully I am prosperous in more important things. I am here surrounded by people who I love completely and I am constantly refreshed by their examples of love. I am constantly motivated by the children and the teachers with their constant strength through adversity and the unpredictable nature of life here. Whether it’s the smallest gesture; a smile every morning, a laugh or a hug it’s all they can give and everything I need. In every smile I know I see everyone who has helped me to get here. I am only here to help because I have been empowered by the generosity of others. I am now able to act for others and help in ways that everyone wants me to and I know many wish they were able to. By helping I have been helped by everyone at home, asante sana. Many smiles and well wishes from everyone here at Stella Maris. First weekend on the job! The soon to be bride in front! The first weekend at the Stella Maris Executive Lodge was an exciting one. As the Foreign Relations Manager/Host/Bartender/Exterminator I have enjoyed a busy weekend! What is most exciting for us all is that we actually have some guests from Virginia and North Carolina here for our Conference Center and hotel accommodations. They are from a non-for-profit Godparents for Tanzania which provides disadvantaged secondary and university students the chance to continue their education with scholarships. We met through the media opportunities/interviews I had earlier this year (thank you Res Publica!). They heard of the work we were doing here in Tanzania and were kind enough to contact me with interest in staying at our lodge. It is so encouraging to hear their stories of success and their desire to help our children at Stella Maris through staying at our Lodge! It has been a great relationship. It is also great because they have been talking with Matt and I, giving advice on what would make their stay more comfortable. So we have been traveling to and from town getting small things like bath mats, no slip shower mats, towel hangers, food items and other miscellaneous things. What is most encouraging is that we have an incredible building and value already, but we see where we can improve. Also we can improve because we have a strong friendship already and they are very comfortable. It is another way that we can set our hotel apart from the competition with the best service, rooms, value and of course purpose and story! One unexpected job Matt and I already had was bartender. We hosted a local young woman’s "send off" this weekend. It was a beautiful ceremony. It is customary in Tanzania for families to have a “send off” for their daughter a week before she is married, since she is starting her own new family. For this occasion more than 300 people joined the family to celebrate the coming wedding. It was my first time ever seeing such a ceremony and we both especially enjoyed being a part of it. Matt and I were excited to help out in any way we could and bartender was apparently where we could help most. Of course everyone thought this was hilarious to have wazungu (white guy) bartenders and the community welcomed us warmly. We were also asked to join the actual ceremony itself. We joined the brothers and stood in front of the bride and “popped” champagne bottles in celebration of our sister getting married! Although we were “working” the party Matt and I had an amazing time talking, practicing our Swahili and just being accepted into the community further. Anyway we can break down cultural expectations and deepen our bonds is an opportunity we have a responsibility to seize. Plus, you don’t get many opportunities to add “Bartender in Africa” to your resume. On Sunday Matt and I made our way over to Mailisita Church to celebrate mass. Unfortunately we had the mass time wrong, and ended up joining the children's mass for the last 5 minutes… whoops! It was a nice mistake though because the children saw us, grabbed us by our hands and “forced” us to leave at the end of mass and hang out with them. We then stayed with all the children who wanted to play and talk outside church. We were all equally happy to have an opportunity to laugh, joke and play with one another. It was still only the second time I was able to really spend time with the children, so it great to pick up where we left off months ago with our typical Sunday routine together. One great highlight for Matt and I was Catherine Izahack, one of our P3 students, leading us in a game of “around the bamboo tree”. After a long discussion and lunch with Fr. Kitali and Fr. Sipendi, we made lots of plans for the future and thought of new ways we could help the community. Matt and I returned to the Lodge so we could go on an afternoon run. I could not think of a better way to spend a Sunday. That night as I was trying to prepare my first entry for my blog from Africa we welcomed some unexpected guests. We have a large crowd of locals who had come to watch the soccer matches at night, so we were all sitting together downstairs. While sitting there one of the girls said “rat!” and sure enough a little rat scurried across the floor and hid under the soda machine. After finally stirring him from out underneath the machine and sending him outside it wasn’t more than 20 minutes when Matt said “whoa there is a tarantula”. I very calmly sat there until I realized that when he said Tarantula, that there really was a huge hairy spider slowly crawling along the floor (way nastier than the de-fanged version I had in my classroom at St. Joseph earlier this year!). Matt and I had typical reactions of 25 year old American men, we laughed, stared at it, took pictures and then had no idea what to do. Luckily a local man stepped up, grabbed some Konyagi "The Spirit of the Nation" and was able to stun the huge hairy spider before “dismissing” it. The perfect way to end an eventful weekend. Just a note; our rooms are upstairs and our downstairs (where the rat and spider came) is wide open for a few hours at night. It is odd to have these “guests” and there is no way that the tarantula or rat would have made it to our rooms…but this is Africa so yes it is all part of the job. I look forward to spending more time in the classroom this week teaching, helping and getting to know the new staff. I will post again soon about the classroom (which has been incredible), but there was too much excitement in the first weekend to ignore! Also I will have a post from “Future Doctor Matt Partain”! Matt is a medical student at Loyola who is volunteering at local hospitals, dispensaries and helping assess and teach me how to assess medical needs of our students at Stella Maris. Our hope is that we can begin to get a better idea of the needs of our students so that they can be more successful in school. Also he is one of my best friends, which makes this a real privilege to share these experiences together. It’s absolutely true and I could not put it better than he already has. From the moment I stepped off the plane my mind was set on the school. As I left the airport and looked out at the sea of African drivers, I could not find anyone there to pick me up. Then through the crowd Matt Partain shouted “Hey Mzungu” (the equivalent of saying “hey white guy” in swahili) all of the drivers first stared at me and then began to laugh hysterically. When visitors come to Tanzania from the plane they are most often tourists or volunteers from America or Europe and are greeted by their tour guides or hosts which are almost always African. I am sure every driver was there looking for their “mzungu” guest, yet I was the only one being greeted and identified by that. In Tanzania it is very common for people, especially children to point, stare and shout “mzungu” when they see white people, especially when traveling to rural areas. It is not meant negatively, but when it is used it often still draws laughs from many older locals. 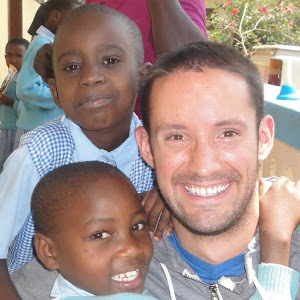 The next morning I started right away and made my way over Stella Maris with Nathan Partain which was very fitting since he was the man I first met with when I thought I wanted to go to Tanzania. I was greeted very warmly by Mama Lucy with a big hug and as she held my hand, she kept repeating “My son is home!” After quick introductions to the new teachers Mama said “let’s go see your students”. She knew where my mind was! As I approached P3, the first class I ever taught as a teacher anywhere, I saw them turn and immediately start talking to one another saying “Mr. Terry!” They shook their hands in their seats and started shouting hello and “Good morning Mr. Terry”. I couldn’t contain my excitement either, because I immediately walked right in, interrupted the lesson, and we all started clapping and singing songs together like I had never left. P2 was also warm and excited as well and when Mama asked them “who is this? !” they all shouted out “Mr. Terry! !” P1 was a strange mixture of excitement and puzzled looks, which was the exact same look every class in Tanzania always gives me the whole “is this guy really here to be my teacher?” I am already excited about the opportunity to get to know each of them and be their teacher. Asking the children "why is Mr. Terry here?" What is also exciting for me is the opportunity to share more of our stories with everyone at home. I feel more complete knowing that I can share in my journey, stay in touch with my loved ones, and fulfill my responsibility to the people in this community. I know for certain that God put a longing in my heart for this place and these people long before I ever came here. He put a desire in me to help these children before I met them. Now that I am back home, I can now continue to do the work He intended me to do. When I left 10 months ago Mama Lucy told these children that “Mr. Terry is coming back for many years” right after I told her I was coming back for a year… but as always mothers know best and here I am staying for a couple years. None of this is possible without the commitment of the Mailisita Foundation, St. Joseph and the many donors and people associated with helping these children. I thank everyone from the bottom of this very full heart for helping me do this work and reuniting me with these people. Going over the recent test results, getting to work right away! There are many stories and emotions that I want to share from these first few days, but I am still processing and reflecting on it. Things have been very busy, and as I am posting this I had to take a break we to get rid of an unwanted guest... a Tarantula! Check back soon and I will update everyone on the most memorable moments from the first few days at school and first weekend helping the hotel…Also I will have some more new pictures! The parents are perfect. The support from the school was endless. Whether it was with an educational decision or with adopting a huge role in helping Stella Maris, there was incredible support. The parents all fully accepted me from the moment I walked into the school a week after being home from Africa (both times). When they pictured the perfect first grade teacher for their 6 year old boy/girl, I can be certain it was not my image they saw. Nevertheless they were patient, kind and open minded to accepting me despite these quirks. Not many teachers are as blessed as I am to know in my heart that every day I was made a better teacher because I was working together with the same goals in mind. The parents are always present physically in the school, helping and supporting me in every way they could. Even when it came time for me to announce my leaving, I was humbled to see the support I got from my fund raiser and throughout the school. I will miss the parents for their support, friendship and Christian example that they have given me. The staff was perfect. I was often visually out of place being the only male primary teacher, but never once did I feel that way. I was blessed to have the single greatest mentor, teacher, friend and example of love to guide me through my years at St. Joseph School in Sharon Shute. She is sometimes lost in my story as a teacher which is why I want to talk about her, because I know she will read this too : ). She not only taught me how to be a better teacher, but also a better example of God’s love for the children of St. Joseph and Stella Maris. She taught me how important love is for a teacher, how it is a tool of strength and the greatest resource of a great teacher. Without love we can do nothing great, that is certain, but Sharon taught me how without love for every student, a teacher cannot be great. With love comes patience and desire to make every child better every day. I would often refer to her as mom because I would talk with her about how to help students but also everything else going on in my life, which I will miss. I will miss her/the staff’s guidance, attitude and love but I know that now it is time for me to be that example for others. The children of St. Joseph were perfect. No school is without “problems” or conflicts, because that is part of the learning process, frankly that’s why we work in a classroom together. However I can honestly say I never left school once thinking “man that was a bad day”. Every day I found myself drawing confidence, strength and inspiration from the children. Every morning they would walk up to me just to share some silly thing that happened that morning, say hi or give me a hug. There is no better way to start a day and I was blessed to have this experience every morning for 2 years. What is most remarkable is not that I love and care for my 45 children I taught at St. Joseph, but that I will miss the other hundreds that walked the hallway. I will miss saying hi to all the children, giving high fives and hearing about what’s new. I will miss watching them grow in abilities and seeing that “light bulb” turn on when they understand a new concept. I will miss the students for their energy, intelligence and love that they have given me but I will carry them always in my heart. Thank you St. Joseph Church and School. You have and always will be my home. I look forward to walking hand in hand together on this journey, because without all of you none of this is possible. I carry each and every one of you who have supported me in my heart and in my actions. I have been so blessed to have all of you in my life and everything I do to help others is made possible from the love I have received from you. Next time I check in (within the next week) I will be in Tanzania. Asante sana na mungu akubariki! Thank you and God bless.